The latest smartphone technology has recently launched along with revelations about neck wrinkles! Dang it! Can we get a break? I guess not! Many of us have heard the concept of “Tech Neck,” which is wrinkles and lines caused by the repetitive motion of looking down at our phones. I think this concern needs to be discussed a little deeper. I believe the way to give yourself the worst neck wrinkles comes not just from looking down at your phone, but when looking down at your phone, when in bed. And have been so guilty of this! At first I was baffled when I started noticing some lines across my neck, until I realized they perfectly matched up to how my neck would crease when I was looking down at my phone in bed. 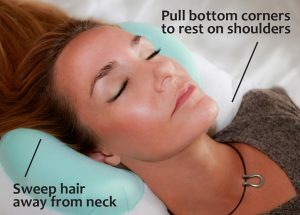 Even though sleeping on your back is the anti-wrinkle position, and my Back to Beauty Ant-Wrinkle Head Cradle beauty sleep pillow keeps you from giving yourself facial, neck, and chest wrinkles while you sleep due to it keeping pressure off of your delicate skin, you can still give yourself neck wrinkles if you are looking downward at your smartphone while laying in bed. I wanted to get the word out! To avoid giving your self “Tech Neck” or as I’m calling it “Bed Neck” you should try to extend your arms upward more level to your face, and make sure you aren’t slumped down in a position that crunches your chin toward your chest when you are a looking at your phone. This is also advisable when reading a book in bed. 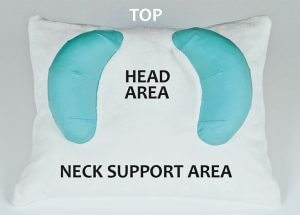 My patented Back to Beauty™ Anti-Wrinkle Head Cradle beauty sleep pillow isn’t just another back sleeping or wrinkle-prevention beauty pillow – it’s a truly unique and versatile form-fitting head cradle that aids in consistent back sleeping, and trains those new to back sleeping, to keep pressure off of, or anything touching, your facial skin during sleep. With an understanding and respect that everyone is different, Back to Beauty’s wrinkle and acne-fighting design, with compact-cradle size, and fluffy hypoallergenic down-alternative fiber, was created specifically to enable use in various positions – allowing you to find your personal comfort zone. Back to Beauty is foam free, and won’t compress to get hard and hot like foam mold pillows can, and retains a full and luxurious feel that supports the neck and stabilizes the head to provide true beauty sleep. I offer free US shipping. Back to Beauty also ships internationally. Please be sure to watch the Back to Beauty Anti Wrinkle Head Cradle Beauty Pillow Tutorial Video.